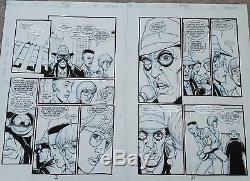 Original interior art by Steve Dillon featuring a Classic hilarious moment in Preacher, where Starr's underlings punk him with the binocular gag! The item "Preacher #63 p5+6 binocular gag Dillon" is in sale since Sunday, September 9, 2018. This item is in the category "Collectibles\Comics\Original Comic Art\Interior Pages". The seller is "kevmatchstick" and is located in Marlton, New Jersey. This item can be shipped to United States.